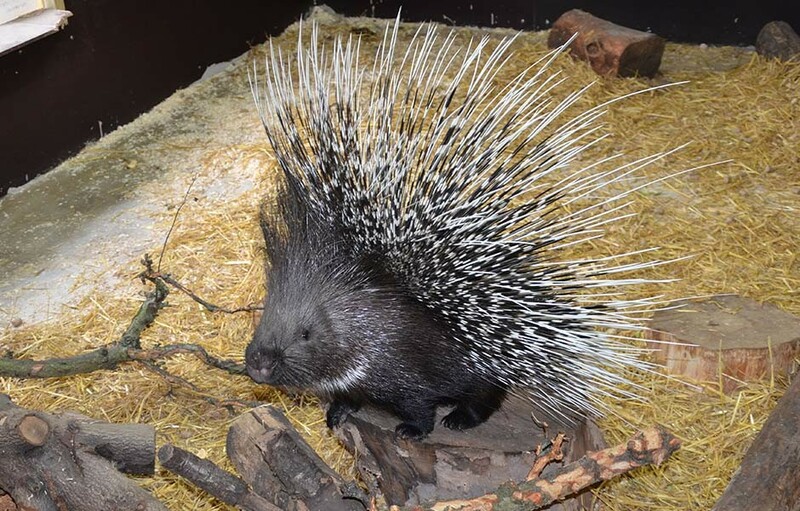 Native to North Africa, the crested porcupine is a rodent which feeds predominantly on roots and fruit. They use their long quills for protection against predators. Each paw has five digits, but the fifth digit on each hand is a regressed thumb, which helps the porcupine hold its food whilst they eat. Hatari came to us in a very distressed state, having been rescued from a neglectful home. He was nervous, recovering from a broken leg and had spent his short life performing, and living in a cage smaller than him. With the dedicated work from our keepers, Hatari is now fully rehabilitated and enjoying a happy and healthy life. Kuchimba came to us a short while afterwards. She came from a great home and has proved a wonderful companion to Hatari. She has taught Hatari something we could not, how to be a porcupine.